Beautiful porcelain doll from China. She is wearing a gold kimono with a brocade obi (sash). She has a lovely blue brocade coat with white fur trim. Her hat is also white fur, with a jewel in the front. 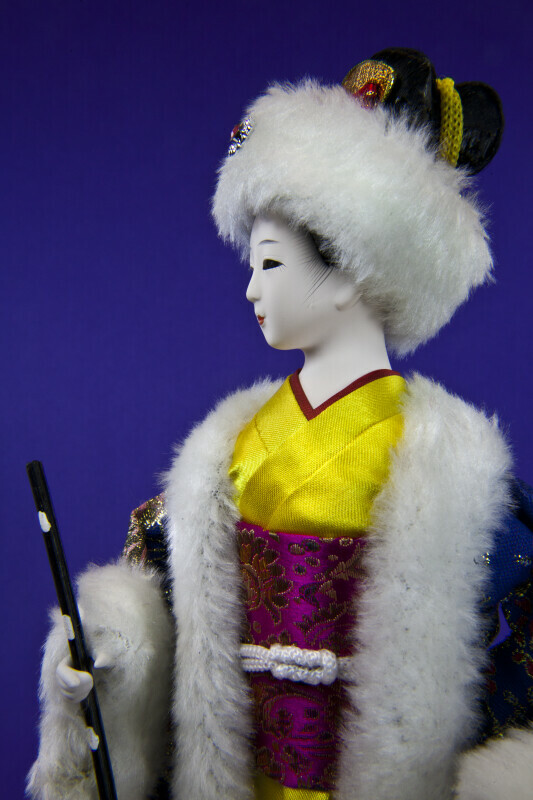 She has a hand painted face on a ceramic head, and her hair is in the traditional geisha hairstyle. She is holding a black stick with red tassels. A small wooden sign says "Dong" or "Winter" in Chinese. The figure stands 11 inches (28 cm) tall. WARNING: You are about to download a 35.8 MB TIFF!